One-on-one piano lessons are taught by Alla Iovel, MM, MA - a long-established piano teacher with a private piano studio located in East Hanover, New Jersey. The lessons are designed for students of all ages and different levels of experience. Mrs. Iovel considers it a privilege to share her extensive (over 35 years) piano teaching experience and thorough pedagogical background with everyone, as well as her proven, unique methods of teaching the piano. It has given her the ability to teach any musical style to anyone. If you are interested in taking piano lessons with Mrs. Iovel, please contact us to schedule an appointment. 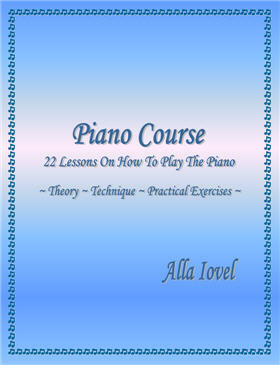 A Piano Lessons Book includes 22 PDF printable piano lessons. The lessons are designed so students may quickly learn music theory as they simultaneously learn how to play the piano within a very short time. The piano lessons suit different levels of experience and abilities, from beginners to more advanced levels, and all age groups, from children to adults. The lessons are logically organized and based upon well-developed, proven, unique methods of learning the elements and techniques of music through the playing of musical pieces. Each lesson covers as many topics as several piano lessons offered by other teachers, while subsequent lessons build upon the theory and practice of piano playing mastered in the previous lesson. The piano lessons cover all basic music fundamentals, as well as all necessary and important topics of piano instruction: from essential piano skills such as piano layout and basic music notation, to chords, scales, rhythm and meter, music theory, and essential principles of piano technique. Even if you have no previous music experience, don't worry - these piano lessons will guide you through the elements of music to successfully learn how to play the piano and discover your potential as a pianist. Your musical hearing, musical memory, motor skills, and logical thinking will show marked and steady improvement. Throughout the piano lessons you will be taught the easy way to learn to play piano songs and improve your skills from home without a teacher. Mrs. Iovel has covered all important topics throughout the piano lessons so you don’t have to go through voluminous literature to learn how to play the piano. Her piano lessons will take your piano playing to the next level. Why let another day pass without fully developing your love of music and the piano? Order your Piano Lessons Book PDF* via PayPal by clicking the BUY NOW button below. If you are interested in purchasing a published Piano Lessons Book by mail, please contact us to check for availability and price. ● Free electronic delivery: within 72 hours after we receive a payment notification from PayPal a printable version of the Piano Lessons Book will be emailed to your payment email address, or other email address you specified in your instructions to us, as an attachment in PDF format. ● The published book(s) can be requested via mail at additional cost. Applicable tax and shipping charges apply. *The actual cover of the published book and the title page of the printable version of the Piano Lessons Book may vary from that displayed. The image is for illustration purposes only. All 22 piano lessons are in PDF format and require the free Adobe® Reader® to view them, available at www.adobe.com. It is highly recommended to save or print the piano lessons for future use once you receive our email with the 22 piano lessons attached in PDF format. The file size is 665 KB. Columbia Academy is unwavering in its commitment to providing the outstanding education. We believe that learning is a life long process, developing confidence enhances learning. Our teaching philosophy is based on the developmental approach to education, learner-centered, with emphasis on group interaction and hands-on, practical training methods. We value the uniqueness and individuality of all students. Office Hours: M - F: 9 a.m. - 7 p.m. Hours of Instruction: M - F: 5 p.m. - 8 p.m. Copyright © 2012-2019 Columbia Academy, LLC. All Rights Reserved.